This the new official short sleeved home soccer jersey of the French Ligue 2 club, Le Havre Athletic Club for the 2017/18 season. It is an official Joma shirt, and is brand new with tags in Joma packaging. We are an official Joma supplier. The jersey features the traditional light and dark blue colours of Oxford and Cambridge Universtities, as it was representatives from those Universities who founded the club in 1872. 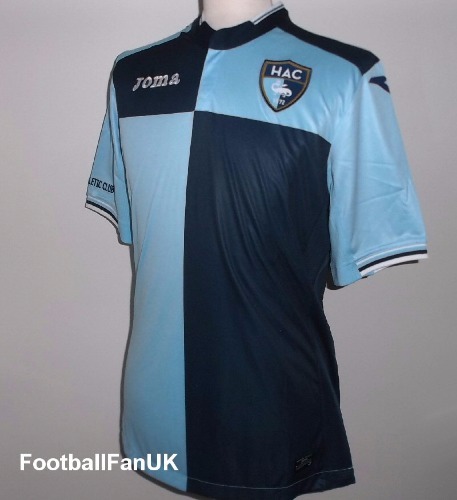 - '1872 Havre Athletic Club' at the back of the neck. -' Havre Athletic Club' woven on sleeve. - 2 press stud collar. - Light and dark blue quarters with white trim.